Snow and freezing weather don’t seem to be ready to leave Berlin yet, which gives you one more reason to treat yourself through your food: time to eat again Raclette, Reblochon cheese – which you will devour with your eyes in my next recipe -, hot beverages & Cie. Chaï Latte and other sweet/spicy alternatives belong to my Must when temperatures are falling down, unfortunately lots of them are often too sweet and let an unpleasant feeling of thirst and need of more sugar in your mouth. Although I was suspicious about the final taste that I would obtain, I still tried to make a homemade Hokkaido squash Chaï Latte, very poor in sugar: quantity of sugar for 2 servings comes down to 3 tablespoons of Maple syrup only, the right amount to warm yourself without feeling guilty. The presence of spices and the sweetness of Hokkaido squash make almost forget the low rate of sugar that could make the beverage too tasteless. The whole recipe is also suitable for vegans and lactose intolerants. 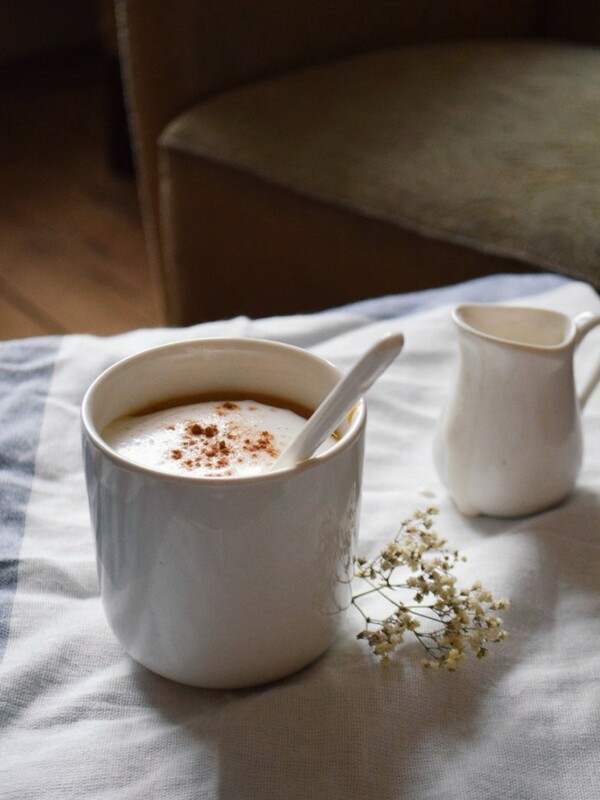 For the Chaï Latte: 170g Hokkaido squash ◆ 30cl unsweetened almond milk ◆ 3 tbsp maple syrup ◆ 1tsp Bourbon vanilla seeds ◆ 2 tsp cinnamon ◆ 1 tsp nutmeg ◆ 1 clove. For the almond mousse: 20ml almond cream ◆ a pinch of cinnamon. 1. On a low heat, make boil the almond milk in a small pan. Incorpore the Hokkaido squash cut in pieces, the spices and stir it well. Let slowly cook during approximately 20 minutes, while stirring regularly. Put a mixing bowl in the fridge. 2. Take the pan away from fire when the squash seems ready and the milk is starting to get thicker. 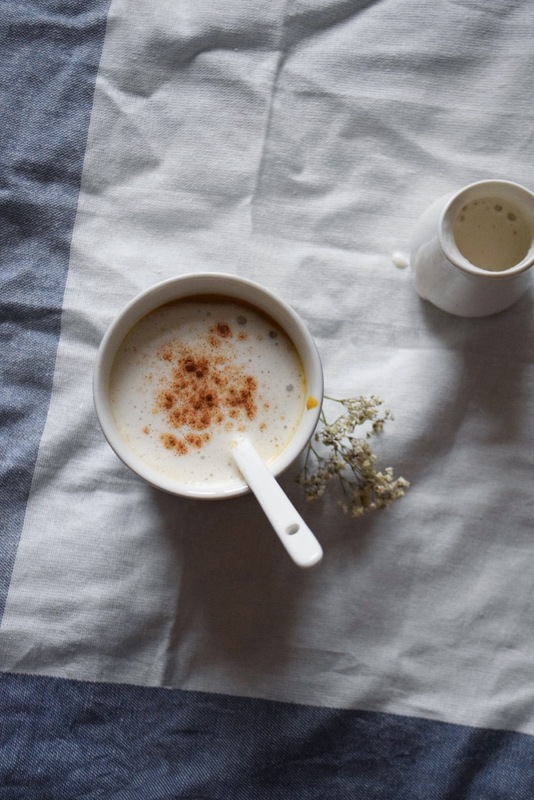 Mix the Hokkaido squash Chaï Latte until it turns into a smooth texture. Keep it warm. 3. Prepare the almond mousse: take the mixing bowl from the fridge, it might be cold now. Add the almond cream inside, and beat it until you obtain a foaming texture, or even a whipped cream. 4. 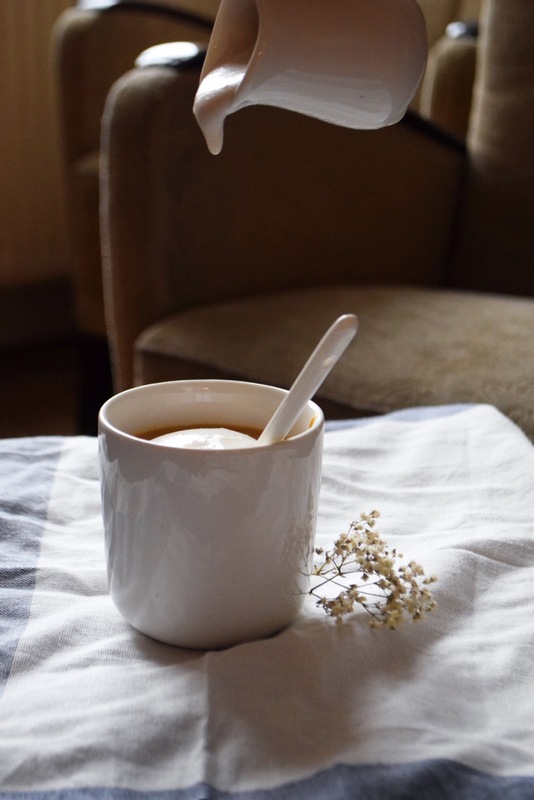 Poor a few spoons of almond mousse on the Chaï Latte mugs, and dust it with some cinnamon, then serve your Hokkaido squash Chaï Latte tepid.